Koush, the developer of ROM Manager, had until now offered as an option (alongside the Google IAP system) upgrades to ROM Manager Premium from inside the free ROM Manager app using PayPal (or as a license on the Play Store), which pretty blatantly violates the policy in question. Now, to be fair, Koush's PayPal implementation existed before Google introduced its in-app payment system (March 2011), but he's also had basically 3 years to get with the program. Correction: ROM Manager does have Play IAPs, but also had PayPal as an option. Some time after the IAP system was introduced, Google began mandating that developers distributing their apps on the Play Store make exclusive use of Google's in-app purchasing system. Failure to do so would get your app removed from the store. Why mandate it? Because like the sale of apps themselves, Google gets a 30% cut of the profits. Using an alternative like PayPal means Google isn't getting in on the action, and when your app's accompanying premium license is one of the top-grossing paid apps on Android, that's something they're probably going to notice eventually. Of course, it apparently took Google nearly 3 years before it decided to do something about it. 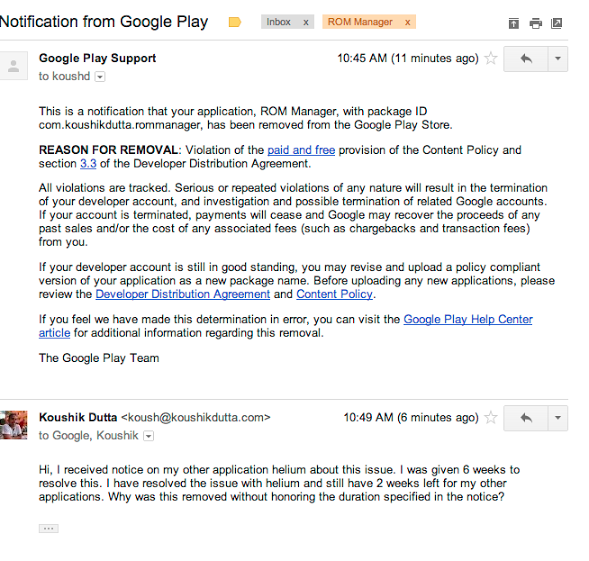 Google had actually reached out to Koush on this very subject about 4 weeks ago in regard to similar PayPal IAPs available in his backup app, Helium. Google gave him six weeks to get into compliance, and shortly thereafter he corrected the issue in Helium. However, without warning, Google then removed ROM Manager from the Play Store, two weeks before the six week window ended. Why? More than likely, someone unfamiliar with the specific situation noticed the ClockworkMod developer account had been flagged for IAP violations, went through the account's existing apps, saw ROM Manager was still in violation, then pulled it. Is this particularly fair to Koush, given he was under the impression he had more time? Not really. Did he also have nearly three years prior to correct the issue? Correction: Since ROM Manager already had Google IAPs at the time, Koush has really had since July 2012 - when Google IAPs became exclusively mandated under the policy - to correct the issue. Yep. I'd also be incredulous toward anyone suggesting he may not have known about the policy, not that ignorance of the rules is much of an excuse anyway. And while implementing the Google in-app billing system may be a labor intensive process in some situations, let's remember: Google didn't ask him to implement a new billing system, they asked him to get in compliance with the policy. Compliance simply means not using an alternative billing system, which merely requires disabling / removing that option from the app, even if just as a temporary measure until the developer can implement Google's IAP system. Might it have been a good idea to do this with any of his apps in violation as soon as he was put on notice? Hindsight is 20/20, I suppose. 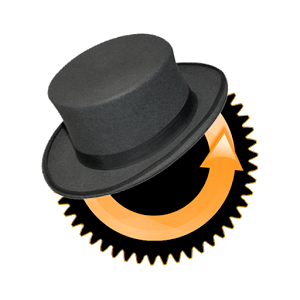 Anyway, we can expect ROM Manager to return to the Play Store as soon as Koush gets the app in compliance with the policy, which given its extreme popularity I have to guess will be pretty soon.